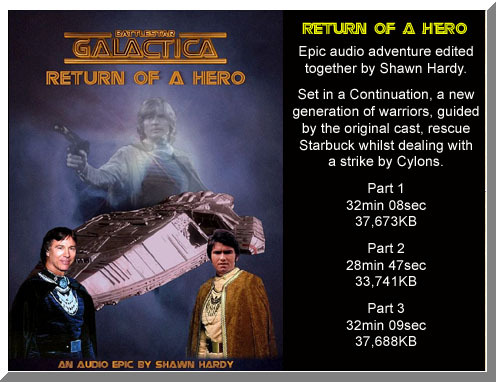 Battlestar Fanfilms is very pleased to support the BrokenSea.com audio stories. The Commander of the last surviving Battlestar, Cdr. Adama, has recorded his thoughts on the history of the Twelve Colonies, the Thousand Yarin Cylon War, the traitor Baltar, the Cylons broken peace accord and much, much more! A HUGE LONG-TERM PROJECT TO CREATE AN AUDIO CONTINUATION LASTING 25 HOURS. THE PROJECT IS EXPECTED TO INCLUDE 36 CDS OF AUDIO, WITH A COMPLETION DATE IN 2008 !